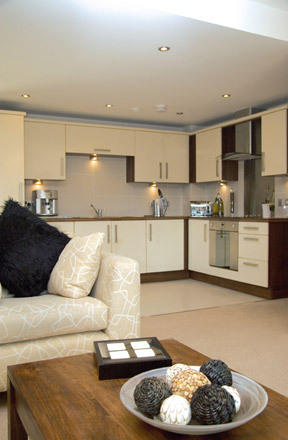 Each apartment has been finished to a very high standard and includes a fully fitted kitchen with integrated appliances, stainless steel multi functional electric oven and ceramic frameless electric hob. The integrated appliances consist of a combination fridge freezer (50/50), with 160 litre capacity, washer/dryer* and dishwasher. There is a wide selection of units/worktops/taps/lighting to suit every taste ranging from standard to executive. The bathrooms consist of bath and shower facilities with partial wall tiling and tiled flooring. Another unique feature of the Bradbury Place development is the intercom audio system which is available remotely as well as internally. This provides the added benefit of making contact with visitors whilst away from home. Each apartment has been allocated its own private parking space. * washer/dryer is stand alone in one bedroomed apartments.